The EMPI GT 2-tip is a great system for small displacement engines where a tight budget is necessary, yet performance is needed. The chrome tips exit the stock holes. It can be used with heater boxes or j-tubes. 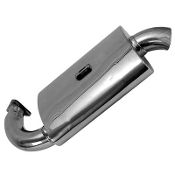 It is one of the quieter exhausts we carry. Don't forget to order clamps! The EMPI GT 4-tip Monza style exhaust is a great classic exhaust. It works well for small displacement engines and gives a distinctive mellow sound. It can be used with heater boxes or j-tubes. Don't forget to order clamps! 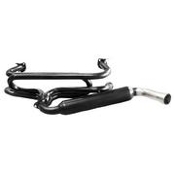 This is a great muffler system to add to your merged headers (#3699 and #55-3699). The muffler tucks nicely up underneath the car. The longer tubing creates and excellent power band for small and large displacement engines. Available in black or ceramic coated. 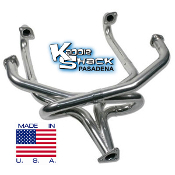 This is a great muffler system to add to your merged headers (#3699 and #55-3699). The muffler tucks nicely up underneath the car. The longer tubing creates and excellent power band for small and large displacement engines. Available in black or ceramic coated. Phat Boy mufflers have a distinctive growl, making your engine sound and run fantastic. They make great horsepower, too. This design is to me used with our MERGED header system (#3699, #55-3699, #7320, #55-7320). Available in black painted, ceramic coated, or stainless steel. Phat Boy mufflers have a distinctive growl, making your engine sound and run fantastic. They make great horsepower, too. This design is to me used with our MERGED header system. Available in black painted, ceramic coated, or stainless steel. Phat Boy mufflers have a distinctive growl, making your engine sound and run fantastic. They make great horsepower, too. This design is to me used with our MERGED header system (#3699, #55-3699, #7320, #55-7320). Available in black painted, ceramic coated, or stainless steel. This high mount muffler increases ground clearance needed for lowered cars, and provides a nice, soft, quiet sound. It fits very well on our #3682 header. It is stabilized by an extra mounting bracket to the cylinder head and tucks up nicely next to the engine. Available in black or ceramic coated. 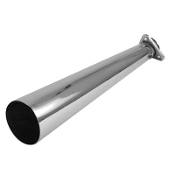 This high mount muffler increases ground clearance needed for lowered cars, and provides a nice, soft, quiet sound. It fits very well on our #3682 header. It is stabilized by an extra mounting bracket to the cylinder head and tucks up nicely next to the engine. Available in black or ceramic coated. These mufflers provide maximum flow and power with a distinct turbo throaty sound. They won’t see you coming but they will hear you going. We recommend this product to be used with the premium extractor (#3100, #3102). These mufflers provide maximum flow and power with a distinct turbo throaty sound. They won’t see you coming but they will hear you going. We recommend this product to be used with the premium extractor (#3100, #3102). The ceramic coating prevents rust and looks great. These mufflers provide maximum flow and power with a distinct turbo throaty sound. They won’t see you coming but they will hear you going. We recommend this product to be used with the premium extractor (#3100, #3102). The Stainless Steel prevents rust and looks great. Update and replace your old J-Tubes. This pair of J-Tubes replaces stock heater boxes, eliminating heater and saving weight. 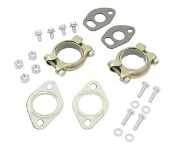 Fits most header systems and includes gaskets. Sold in Pairs. 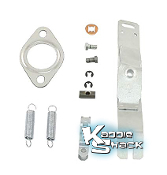 This repair kit contains all the parts to fix one heater box linkage. If yours are bent, broken, missing pieces, etc, they can be repaired with this kit. Sold each: Left or right. Some prefer a stock exhaust system on their Bug. This is a quality European made muffler. Does not come with gaskets, tailpipes, or clamps. Will not fit 40HP or earlier engines. Black Stinger with swivel flange to rotate to any desired position until tightened. 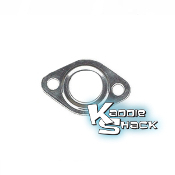 Fits most manufacturers small 3 bolt flange. This open exhaust is LOUD. You might want to get the optional baffle to tame it down a bit. Ceramic Coated Stinger with swivel flange to rotate to any desired position until tightened. Fits most manufacturers small 3 bolt flange. This open exhaust is LOUD. You might want to get the optional baffle to tame it down a bit. 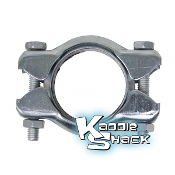 Chrome Stinger with swivel flange to rotate to any desired position until tightened. Fits most manufacturers small 3 bolt flange. This open exhaust is LOUD. You might want to get the optional baffle to tame it down a bit. Everything you need to install you stock exhaust. 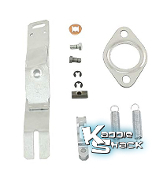 Includes all necessary gaskets, clamps, bolts and nuts for installation of stock muffler (1-3/8) and exhaust system. Covers heat riser flanges when heat riser is not used. 23-1/4 Long black baja style stinger. Fits Large 3-bolt flange. 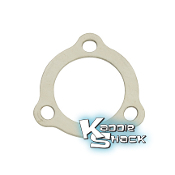 Replacement gasket for your small 3-bolt flange connecting your header to your muffler.